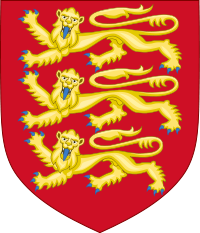 Coat of Arms: The coat of arms of England has three identical golden lions with blue tongues and claws. They are aranged in a column with a red background. Note: The Tudor rose, shown left, symbolizes the end of the Wars of the Roses.